As 67 members of the Electoral College ask for a briefing on what the intelligence community is telling Congress, right-wingers fight back. 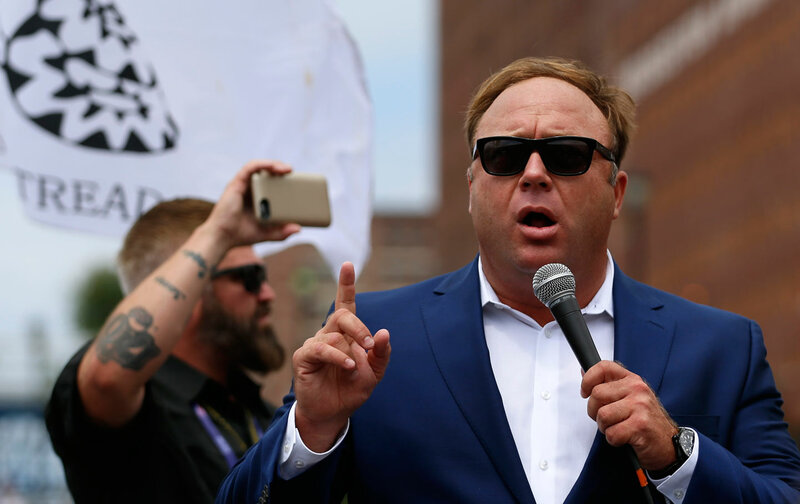 Right-wing conspiracy monger Alex Jones has been scrubbing his Infowars site of “Pizzagate” content, after a Trump supporter shot his rifle at the Washington, DC, pizzeria that Infowars dangerously and falsely claimed was the hub of a child-trafficking ring run by Hillary Clinton campaign manager John Podesta. But now Jones has a new target: California Democrat Christine Pelosi and the 67 members of the Electoral College who are seeking an intelligence briefing about evidence that Russia hacked and distributed the e-mails of Podesta and the Democratic National Committee in order to help Donald Trump. The violence inspired by “Pizzagate” didn’t encourage Jones or Infowars writers to choose their words more carefully. They’re now accusing Pelosi and “rogue elements of the CIA” of “laying out a case to justify stealing the election from Donald Trump, or assassinating him outright.” Jones fulminated against “[Nancy] Pelosi’s daughter herself” on his radio show (where President-elect Trump has been a guest) and promised “civil unrest” if electors reject Trump. Jones fans are responding predictably with death threats and abuse to Pelosi and her family via social media, e-mails, and voicemails. Pelosi is undeterred, continuing to build support for a plan to have electors briefed on what the intelligence community knows about Russian government involvement in the Democratic hacks. It began with 10 electors; it’s up to 67, at least publicly. “It’s my right to know, the American people should know, and I don’t know why [Republicans] don’t want to know,” she said in an interview Wednesday afternoon. In fact, a growing number of Republicans do want to know—but not until after Trump is inaugurated. At least five GOP senators have called for some kind of investigation into what intelligence agencies know, and how they know it, when the Senate returns early next year. But Pelosi wants members of the Electoral College to be briefed as well, before they vote next week. Either the information that’s been presented to Congress could be declassified, she says, presented without revealing methods or sources, or the electors could receive a temporary security clearance to hear it. On Thursday, outgoing Senate minority leader Harry Reid came out behind the plan. “I’ve gotten death threats!” she shot back. “So it’s not helpful for me if you’re going to lie about what I am saying. That’s not helpful for me, that’s not safe for me or my family.” She told the host: “This is really about finding out the truth…. If it was reverse, Neil, you know and I know that the congressional Republicans would have already have held hearings.” On Thursday morning, Pelosi shared screen shots of the backlash to her Cavuto segment on Twitter. Alex Jones certainly fears that. The man who insists that the Sandy Hook massacre was a hoax, and that the US government was behind the 9/11 attacks and the Oklahoma City bombings, claims that the CIA has fabricated evidence of Russian involvement in hacking Democrats, and wants Pelosi’s quest stopped. (Trump has appeared on his show and praised his “amazing” reputation.) Pelosi takes the threats in stride, but says she knows they’re keeping some electors who support her quest from coming forward.